This year will be our ninth Valentine’s Day together, so as you can imagine, gift giving isn’t as big a deal as is was back when we first became a couple. Nowadays, Valentine’s Day is less about showering each other with countless soppy gifts, but instead about showing love and spending time together. I’d take a night in with a takeaway, bottle of wine and a good film over going out, and one thoughtful gift over lots of novelty presents. I love the range of personalised gifts, such as the cute little illustration, and the ‘What I Love About You’ book where you can jot down your favourite things about the one you love as a keepsake. There there’s the printable fortune cookies and the Date Night Bucket List full of ideas for nights out with your other half! The personalised cassette doormat is perfect for the music lover, or there’s the spa pamper set for someone who deserves to take some time out from their hectic schedule. If you still want to spread some of that traditional Valentine’s cheer, why not step away from the cheap chocolates or pink teddy bears and opt for something a little different, like the heart shaped umbrella for the girl who likes to stand out from the crowd, or the sweet ‘falling in love’ print for your sweetheart. One of my favourite alternative gifts from Uncommon Goods has to be the Love Is Art kit, where you and your beau can create a piece of art together for your home with the set of paints and other accessories! Then finally, there’s the ultimate gift in my eyes and one for all the food lovers – the ampersand cheeseboard, complete with space for crackers and other carb filled delights. If in doubt – CHEESE! What will you be buying your true love this Valentine’s Day? 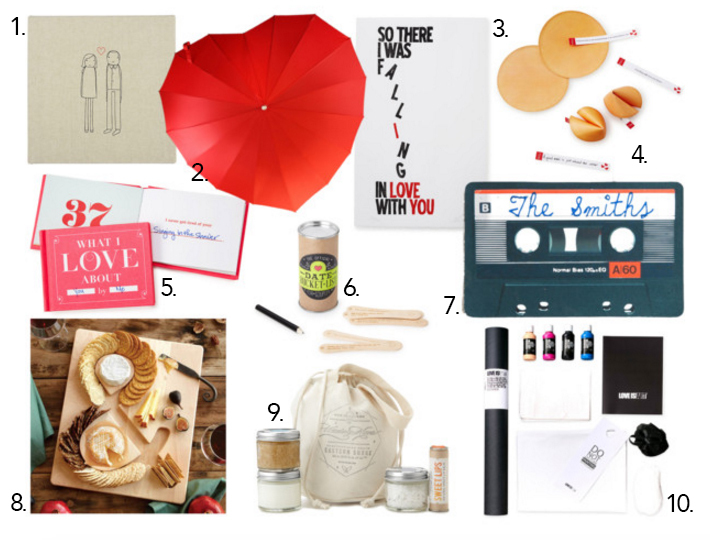 What would be your idea of the perfect Valentine’s gift?